Having problems finding the right woodworking clamp for the project you are working on? You can find C-clamps in almost every workshop, and the majority of people know the basic stuff regarding the C-clamps. But, you can see a lot of different clamp types out there that each has its purpose in woodworking. If you are just a beginner who is planning on opening his shop or even doing some DIY projects, then all of this can be a little confusing to you. For you to be able to find the right clamp we wrote you a brief guide explaining some of the most used clamps. People most commonly use this type for woodworking, and they are also cheap. 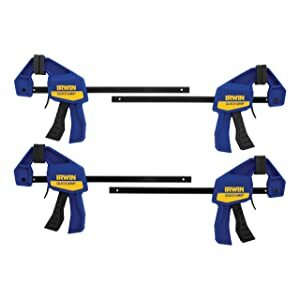 They are best for metalworking projects and general carpentry. They are a bit limited because of the size of the restraints on them, but you can find some that have a deeper C shape which gives you room for moving things around. One significant downside of this type is that they tend to wear off quickly, but their price makes up for that since they are often cheap. You can see people owning different sizes of the C-clamps for various projects they are working on. 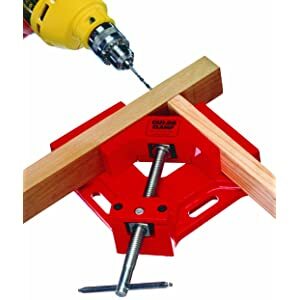 The Miter clamp is excellent if your project requires you to hold down two different pieces together at the right angle. The clamping fixtures on this clamp are set at an exact 90-degree angle. You only have to slide the board in, tighten the grip and the clamp does everything else. 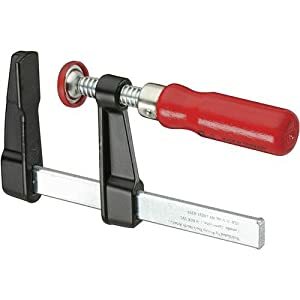 People most commonly use this clamp type for moldings, picture frames, and miter joints. If you are working with objects that are a bit unusual like irregular shapes, circular work, and picture frames, then this is the type for you. Most people don’t get this until after they go through the struggle of working with c-clamps on unusual objects. This clamp is suitable because it gives you the ability to clamp a more prominent area that has odd angles. Bar clamp is the type of clamp you want if you are working on a more significant project. Typically, they are best for tables, furniture, and other similar jobs. The Bar clamp is the clamp type that is most useful on woodworking projects. Bar clamps are a little more expensive when you compare them to other clamp types. Still, investing money in high-quality stuff can never be a disappointment because you will find a use for it down the road. If you are going for this type, avoid buying the ones out of aluminum because they can easily bend and this way lose torque. This clamp type guides you through making straight cuts. It is best to combine it with a router or circular saw for the best results. When using this clamp type, you won’t have to ever worry about not making completely straight cuts. 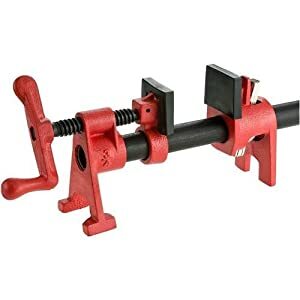 Just by looking at the name of this clamp you can guess that it is best to use it for projects that include pipes. This clamp type has shown itself exceptionally useful when working on big projects and you can also use it as a torque machine. The best thing about these clamps is that they don’t have size restrictions on objects you are clamping. You can work with the most massive pipes, and the clamp will work as good as when you are using it on small tubes. The Habdscrew Clamp is maybe the oldest clamp type that is still in use today, and shipbuilders are the ones that are using it the most. Even people who build cabinets can prove this thing useful. These are only some of the many clamp types you can use. Whatever project you are working on, be sure that there is a clamp that fits your needs. Here we have described the ones that are the most popular today. It doesn’t matter what clamp type you choose to use; some general rules refer to every model. Here we have listed them. Use scrap wood– To prevent damage on the piece of wood that you are working on, make sure to put a piece of wood that you don’t need between the two jaws of the clamps and your project. Firm even pressure– If you don’t want your project to slit through the clamp, make sure to apply the pressure at the right angle to the line where the glue is. Clamp-on tight– When you have positioned the clamp, tighten the jaws until they are immovable. If you have paste in your project, then you will see some squeezing near the joint, and this shows you that the clamp is tight enough. Don’t overdo it– Sure, it is essential for the clamp to be fast, but it is also necessary that it isn’t too tight. The primary purpose of the clamp is to pressure equally from both sides. You shouldn’t use the clamp as a way of forcing those surfaces together. Medium pressure is all you need. Avoid surface damage– To avoid c-clamps from damaging your project, just use milk caps like pads. Now that we have given you some necessary information about clamps and which ones you should use on which project we can go on and give you our list of best clamps. 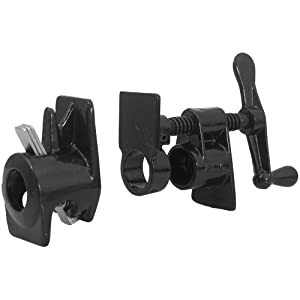 This clamp is best used for panel door, box, and flat panel assemblies or even other projects that need you to apply even pressure. Jorgensen reinforced the jaws with steel, and they make sure that the pressure is evenly distributed over the large area the jaw clamps. Also, the jaws on this clamp are parallel which makes prevents the workpieces from bowing or lifting. This clamp is also great because it can stand upright on its own which means that you can use it with only one hand and it also has a head adjustment that slides easier. The sliding head that you can find on the clamp and bar can act as a spreader. And the most important thing is that this clamp has a secure locking system which makes sure that the jaws don’t slip. 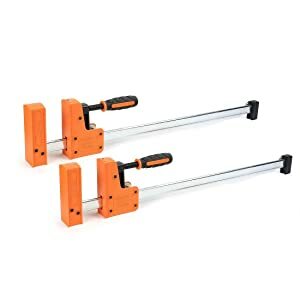 If you want clamps for woodworking that offers you a large capacity, then this is the one for you. 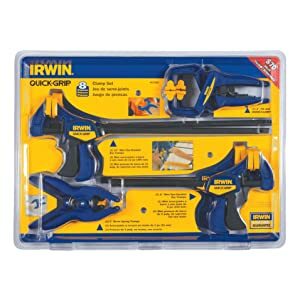 The Irwin company used high tech so that this clamp can achieve high-quality and high-precision. This clamp is durable because they made it out of reinforced resin, which also increases its strength. For easy and fast positioning, this clamp has a quick-release feature. The mechanism of this clamp also ensures an adjustable clamping pressure, and it also reduces hand force significantly. A great thing about this clamp is that it can hold lots of different shapes. This item produced by Irwin is unique because it has a different design than other woodworking clamps. By the look of it, it may seem unusual, but be sure that it will do a fantastic job. If you are working with workpieces that are smaller and in confined spaces, then this is the ideal clamp for you. This clamp has a force of 140 pounds, and with this, you can distribute the workpieces well. It is a very durable product made out of resin that is hardened with steel, and this way it can bend or flex. Also, by using the one-hand triggers, you can instantly release the clamps. If you want a different and unique clamp, then check this one out. Almost every other clamp that you can find in today’s market isn’t unique, and you can see a close relationship between every one of them. Not in this one. For high pressure of clamping, this product features a sliding T-handle. 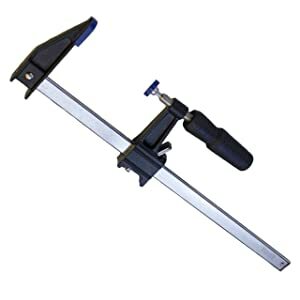 For easy mounting on the workbench, this clamp features mounting holes and a movable jaw. They made it out of sturdy aluminum which means that it is durable and it won’t rust. The Bessey brand is respectable in the woodworking world. It has invented designs that ensure stability and clearance. Also, their special is that they produce soft jaws so you won’t damage when working on soft materials. This clamp offers stability on a dual-axis with an H shaped foot. The base that is extra high ensures clearance from the work surface. The jaws have caps that prevent the materials from being damaged. It also offers you a transparent surface of work with its crank handle when you are closing and opening the jaw. 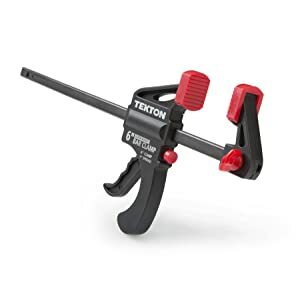 When we are talking about woodworking clamps, TEKTON is remarkable. They use heavy duty materials in the production of clamps, and this way they ensure that they will last for a long time. This clamp is versatile, and it can be used for fastening, gluing, and assembling in metalworking, woodworking, and in automotive applications. This clamp is extra durable because it is made out of iron and it also has an I-beam design. The screws on this clamp glide smoothly without sticking or binding. For the pressure to be applied evenly, this clamp has a swivel jaw pad that floats inside a ball that provides low resistance. One of the best clamps in the industry is the Peachtree clamps. The best thing about these clamps is that they are made and designed in a way that makes it easy to use. For better stability, a broad base is a crucial part of this clamp. For better table clearance, the manufacturers raised the handle on this clamp. If you don’t like struggling when rotating the handle, then you will have to get this clamp because it offers comfortable and smooth handling. Another great thing about this clamp is that it is also beautiful because it has a finish made out of baked enamel. If you need a clamp that offers large capacity, then this is the one you should get. You definitely will love this one as it ensures excellent performance and efficiency. 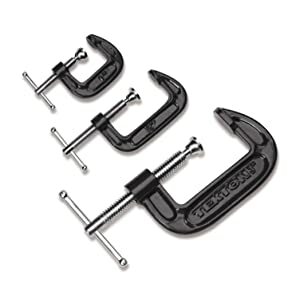 For better comfort and clamping pressure, this clamp features an ergonomic handle made out of plastic. For better gripping of all kinds of shapes, this clamp has a swivel jaw pad. When working with delicate projects, you won’t have to worry about damaging them because this product has a plastic cap that prevents that from happening. For a better grip on the steel rail, the iron arm features two clutch plates. When working with small pieces, this clamp is the perfect thing for you. It has a powerful nylon jaw. It is the perfect clamp for tight spaces, small crafts, and small projects. It offers you a consistent and precise pressure when holding two workpieces together for assembly or gluing. For fast release, just press a button so you can reposition the jaw. The jaw is stable, and it won’t slip. With the jaws having soft pads you won’t have to worry about damaging your project. This fantastic clamp has a design that is great for light duty work. It is perfect for holding the work down and gluing. You can also use it as a universal clamp. The best thing is that it is straightforward to use and the process of installation is pretty simple. The handle is made out of ergonomic wood, and it features a protective cap that is used to prevent the damaging of the materials. No matter what project you are planning on starting, there will always be a type of clamp that can assist your work. Just be sure to take your time when choosing the right clamp. Also, don’t be discouraged if you choose wrong, because woodworking is based on trial and error. It will take some time before you find the one that is best suited for your job. We hope that we have helped a little!